I am thrilled to host the cover reveal for the latest short story anthology from my local Sister in Crime chapter. 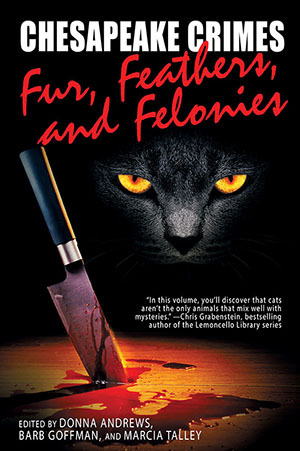 Featuring thirteen tales of critters and criminals, this eighth volume in the Agatha, Anthony, Derringer, and Macavity award-winning series is sure to delight readers far and wide. This chapter anthology is once again edited by the incomparable team of Donna Andrews, Barb Goffman, and Marcia Talley. 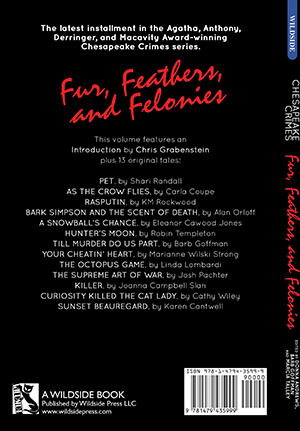 Ordering information for Chesapeake Crimes: Fur, Feathers, and Felonies will be coming soon (this collection is due for release in late April 2018), but for now, it’s just exciting to see the new cover, get a glimpse of the story titles and authors, and celebrate this SiC chapter’s latest accomplishment. Terrific cover. It will certainly attract readers. I agree. It is a striking cover certain to garner attention. Great cover! Thanks for sharing it, Kristopher! Cover excellent; stories inside even more so! Thank you for the tease, Marcia. Looking forward to it. Thanks for hosting our cover reveal, Kristopher! We have stories involving dogs, cats, cows, birds, bunnies, fish, ferrets, and even an octopus. So looking forward to the April release. Thanks, Kristopher! It’s great to see this! I agree Ellen. Thanks for stopping by. Jungle Red Writers 7 smart and sassy crime fiction writers dish on writing and life. It’s The View. With bodies. 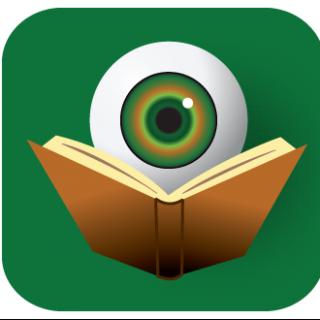 Mugsy's Musings Crime fiction blog from Dave Magayna.